Industrial Controls Training for Carotron, Inc. Distributors – FREE! At Carotron, Inc., our goal is not only to help you become a top distributor in the industrial control systems market due to high quality and low pricing, but to also be recognized as a knowledgeable distributor in the eyes of your customers. Imagine how many more products (drives, controllers, etc.) you can sell after you’ve undergone industrial controls training with skilled engineers at our facility. And what if we told you….it’s FREE at our plant? It’s true – Carotron offers control systems training at no charge…informative sales training to teach you how our products work AND how to sell Carotron control products to your customers. We can even put together local seminars at your facility. We have sales literature, customer handouts and presentation CDs that you can place in your customers’ hands. We believe there are still thousands of industrial applications using DC motors that simply need a new DC drive…not an entire motor replacement. You probably agree. This is one area, however, that often confuses many of our distributors as well as end users. The reason? New AC drive manufacturers and distributors almost always push the customer to replace their older DC motor with a new AC motor. This can be a very costly move if the older motor still works fine. That’s where we come in…and you as our distributor. This is why we specialize in DC motor drives and provide retrofit solutions for older or obsolete drive applications. If you want to tap into this often overlooked market, you can take advantage of our motor control training with emphasis being on the DC drives that we create. We can show you how retrofit DC drives have been used for specific industries, and how we have saved customers thousands of dollars! Do you cater to certain industries or particular types of applications? We can help you discover the “secrets of success” in your industry through our personalized training. While in our local training room, you can get hands-on training that is specific to your industry or specialty. We won’t bore you with information that doesn’t apply to your customers’ needs. >> See examples of Carotron product applications similar to those that your customers use. >> You’ll receive tips and training from our skilled engineers, and often from those that actually designed our products. Our staff of engineers works locally at our plant in Heath Springs, SC (USA), developing and testing products on site. >> Visiting our facility gives you an opportunity to see “behind the curtain” of Carotron and learn how we operate. >> Meet our customer care staff, sales engineers and others while learning how to better present our products to your clients! Products You Can Count On…. Don’t rely on a fly-by-night industrial control manufacturer to supply your products. 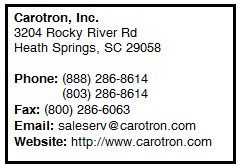 Carotron has been serving distributors worldwide since 1984. We don’t claim to have all the answers..but we are ALWAYS available 24/7 to help with applications specific to industrial control and our products. Even if you’re unable to visit our local facility for instrumentation and controls training, we are just a phone call away. We can make joint calls with you and your customer to troubleshoot and help you select the right drives and controls. Carotron products include (but are not limited to) dc and ac motor drives, ac inverters, a variety of din-rail mountable controllers, digital solid state starters, microcontrollers, potentiometers, tachometers, distance measuring devices, voltage-to-frequency and frequency-to-voltage converter modules, and many more. We also sell Yaskawa AC drives, Red Lion HMI products and panel meters, Lenze-AC Tech drives, KB Electronics drives, Opal Pro Series Starters, Dynamatic® Eddy-current drives, and other companion products. *** Also, follow us on Facebook, Twitter or our Carotron Blog today!